You are currently browsing the tag archive for the ‘grim ‘n’ gritty’ tag. Fellow blogger Colin Smith over at Too Busy Thinking About My Comics has been on a roll lately. First there was his excellent series of articles on Grant Morrison and Frank Quitely’s All Star Superman versus J. Michael Straczynski’s Superman: Earth One . Then he quickly followed that up with another series on the DC event series Kingdom Come. What can I say, I like his comic reviews. Also I am all over the comments threads for these pieces like a bad rash! So I am taking a leaf out of Colin’s book and doing two comic reviews this weekend on the writers I am most excited about for 2011, starting with Paul Cornell. Chances are, whether you know it or not, you have already enjoyed his work. With an impressive television career, he’s written for everything from Holby City to Coronation Street. Prior to his entry into American comics Cornell was mostly known in nerd circles for his Doctor Who novels, at least one of which was adapted for television, the excellent Human Nature. With a CV like that, and with Marvel/DC overrun by television writers such as Joss Whedon, Marc Guggenheim and Allan Heinberg it’s no wonder Cornell got a shot. To date his comic career has shown a fondness for injecting a vibrant (and welcome) sense of optimism into the vicariously grim affairs of superpowered folks who like to wear garish costumes. He also specialises in rediscovering discarded characters and concepts, giving them a bit of a polish and then expanding upon their initial appearances. Dark X-Men was published during a company wide storyline by Marvel Comics known as Dark Reign. To summarise in brief, the villains won and the US government itself has been infiltrated by arch-manipulator Norman Osborn, an erstwhile Spider-Man antagonist given a new shot of life by the series. As such he has adopted an aggressive public relations campaign, creating his own superheroes, including a new X-Men team – filled out with former supervillains given new identities. His X-Men are the shapeshifting terrorist Mystique; Beast an evil doppelganger of this world’s Hank McCoy from another timeline; Mimic, an opponent of the original X-Men who first appeared back in the 60’s; and Omega, who was recently possessed by a destructive entity known as The Collective. A wave of mass suicide attempts, with each individual chanting ‘I am an X-Man’, alerts Osborn to a new crisis. He is not so much concerned about the potential loss of life as he is copyright infringement. He orders the team to investigate. The duplicitous Mystique, who is attempting to gain the support of the other team members to revolt against Osborn’s control, discovers the cause of these events is a psychic being thought dead known as ‘X-Man’. The team is ordered to capture and detain this immensely powerful mutant. However, they come to realize that if X-Man defeats Osborn, perhaps they could profit by the new regime. Villains will be villains after all and one double cross leads into another. Where Cornell’s script excels is in its shades of grey. Mystique has betrayed so many people in her life no one trusts her anymore. As it happens she is only leading Osborn’s X-Men as he has placed a bomb on her that he will detonate if she tries to rebel. Mimic is tortured by his own inadequacies. Leonard Kirk draws him to resemble the original X-Man character Warren Worthington. This is a cruel joke on the character, a hired gun in the employ of a madman who has deceived the general public to see Mimic as a hero. 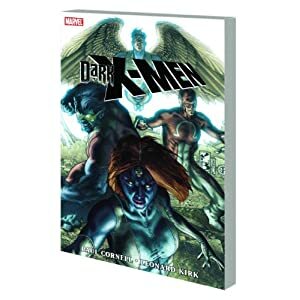 Dark X-Men is a book about characters who want to be something more than doppelgangers and stealers of powers. The sting in the tail of the book’s final panels is perfectly done. The X-Men are not so much superheroes, as civil rights advocates in comic book hero drag. Osborn complains ‘Mutants are super heroes with politics.’ Cornell not only nails that ambiguity, he realizes the full potential of such X-Men action clichés as psychic combat, introducing Kirk’s grotesque image of a brain composed out of hundreds of bodies. The formerly lugubrious X-Man, Nate Grey, is rescued from comic limbo. There’s even hilarious running jokes throughout (each character is introduced on panel with a song title that describes their traits). Combined with Kirk’s soft, yet dynamic pencils (the moment when Beast cheerfully smiles is both cute and terrifying) that rivals Stuart Immonen, this book is both action packed and thoughtful. Great fun. Midnight Kiss is a densely plotted, cleverly written and beautifully drawn tale of mayhem and mystery in fairyland. These fairies, however, use some pretty heavy artillery and most of them make the Hitler gang look like a teddy bear’s picnic. Add fabulous references to a Land of Oz fighting a vicious civil war, a bunch of fabulous creatures being hunted for their hearts and minds (literally) and you have one of the richest, most original, engaging and fast-moving graphic stories of the new century. The above quote is taken from Michael Moorcock’s introduction to this comic book collection. I chose it as this fulsome praise convinced me to buy the book. Moorcock was approached by Lee for permission to use his dimension-hopping anti-hero Jerry Cornelius for this book. One of the most popular of Moorcock’s creations, one that he has in the past allowed other New Worlds authors such as M. John Harrison to use, Cornelius is a devious, dimension-hopping anarchist, perfectly suited for Lee’s story of a multiverse of fantasy realms. Given that this book had Moorcock’s stamp of approval, I bought it without hesitation. The story begins with a boy named William being confronted by a gang of gun-toting Unseelie Fae, mistaken by him for vampires. Moments before he is captured, Matthew Sable and Nightmare De’Lacey arrive and decimate the heavily armed fairies. The mystically empowered duo explain to William that he is what they call a ‘rational’, someone who believes that one world and reality exist. Sable explains that millennia ago an event called the shattering occurred, with each realm of faerie separated into different dimensions. What normal humans, rationals, assume are fictional worlds or fantasies are actually each unique threads within the multiverse. William has become the target of a conspiracy to create a demonic demiurge due to his own mysterious parentage. A series of assassinations are being carried out against different creatures of fantasy across a number of worlds. Now that William is under the protection of Sable, two murderers for hire called Jonny Cool and The Flickman, are contracted to recover him. They slaughter their way through several dimensions in pursuit of their quary. A third story thread concerns a police investigator known as Einhorn trying to discover what is behind the series of murders relating to the conspiracy. Each of the protagonists are drawn to the Land of Oz, torn apart by a civil war between the forces of the evil Scarecrow and President Dorothy Gale. I am sorry to report that I found this to be a bleak and dispiriting story. Despite the warm introduction from Moorcock, Midnight Kiss resembles a derivative, grim ‘n’ gritty take on Michael Ende’s The Neverending Story. The excellent blog Too Busy Thinking About My Comics recently proposed a dark take on Robin Hood for satirical purposes. Wouldn’t you know it, the Sherwood Forest archer appears here, consumed with feelings of revenge towards Matthew Sable (for reasons too silly to go into). Our heroes use their magical abilities to sprout dayglo guns and swords from their arms, slaughtering their opponents with impunity. At times I was confused as to what distinguished them from blood-thirsty antagonists Jonny Cool and The Flickman. Of course the break-neck twist in the final issue addresses just that ambiguity with groan-worthy results. Poor William is also just another derivative messiah-child, being dragged along in a state of constant confusion until the plot demands that he suddenly assert himself. As to Jerry Cornelius’ role in the proceedings, well he’s basically a bag-man. His ability to cross dimensions is here employed to run errands on Sable’s behalf. I found this especially amusing as Moorcock cites Lee as having ‘got’, Cornelius’ function as a character. Tony Lee’s afterword mentions that other writers had misused the character in the past, without consulting his creator. I assume this is a reference to Grant Morrison’s attempt in his seminal book The Invisibles, there named Gideon Stargrove. Ironically I thought the unauthorised use of the Cornelius concept was far more successful than the fully approved one in Midnight Kiss. Ryan Stegman’s art may suit the material, blood clotting on the panels and breasts thrusting outwards, but once again it reminded me of the bad old days. If you look at the cover image below you will notice a huge robot. Yes, that’s The Tin Man.